Andrea di Pietro della Gondola, known to history as "Palladio," was born in 1508 in Padua, a mainland possession of the island-based Republic of Venice. Apprenticed to a stonecutter in Padua when he was 13 years old, Andrea broke his contract after only 18 months and fled to the nearby town of Vicenza. In Vicenza he became an assistant in the leading workshop of stonecutters and masons. Andrea's presumably settled life was transformed in 1537, when he was 30 years old. At that time he was engaged by Gian Giorgio Trissino, one of the period's leading scholars, to assist in executing new additions which Trissino had designed for his own villa at Cricoli just outside Vicenza. The association affected Andrea in at least three ways. First, Trissino immediately assumed the role of Andrea's mentor and set about the task of introducing him to the principles of classical architecture and the other disciplines of Renaissance education. Second, Trissino introduced his protege to an ever widening circle of patrons, first in Vicenza, then in Padua, and finally in Venice itself. 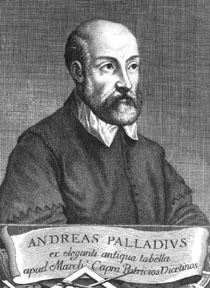 Third, Trissino bestowed upon Andrea the name by which he was to become famous: Palladio. Suggesting Pallas Athene, the Greek goddess of wisdom, the name was also used by Trissino for an angelic messenger in an epic poem which he composed during the same period. Through their books, Palladio learned the principles of Vitruvius, the classical Roman architect whose treatise had been rediscovered in the prior century, and of the Renaissance commentator, Leon Battista Alberti. Through personal contact, he became acquainted with the ideas and works of pioneering architects of his own period, including Giulio Romano, Giovanni Maria Falconetto, Sebastiano Serlio and Michele Sanmicheli. Under Trissino's sponsorship, he received further introduction to classical Roman works and to early Renaissance works on visits to Padua and Venice (1538-9) and an initial visit to Rome (1541). By 1538, probably aided by Trissino's influence, Palladio and his workshop had begun construction of Villa Godi, the first of a series of country villas and urban palaces designed by Palladio in the following years for patrons among the provincial nobility of Vicenza. A decade later Palladio began receiving commissions for country villas from prominent and wealthy leaders of the nobility of Venice itself, such as Daniele and Marc'Antonio Barbaro and Giorgio Cornaro. The wealth and aspirations of these new patrons evoked from Palladio those grand and innovative creations of his middle period upon which his influence on all later Western architecture is based. Finally, in 1560 Palladio received his first commission for a work in Venice itself: completion of the refectory for the Benedictine monastery of San Giorgio Maggiore. Other religious structures in Venice followed: the cloister of the monastery of S. M. della Carita (now the Accademia Museum) and the facade of the church of S. Francesco della Vigna. His Venetian works culminated in three magnificent churches which remain today: S. Giorgio Maggiore, Il Redentore and "Le Zitelle" (S. M. della Presentazione). (Another Palladian church, S. Lucia, was razed in the mid-19th century to make way for the railroad station.) Surprisingly, despite numerous efforts, Palladio never received any secular commissions in the city of Venice. Palladio was an accomplished user of the new technology of movable type, then only about one hundred years old. His first book was a guide to the classical ruins of Rome, prompted presumably by his own frustrations in attempting to locate various monuments during his visits to that city. He also published, with his sons, a new translation of Caesar's Commentaries and contributed illustrations to Daniele Barbaro's annotated edition of Vitruvius' treatise on classical architecture. Then, in 1570, following years of preparation, he published in Venice the masterwork that ensured his place in architectural history, I Quattro Libri dell' Architettura [The Four Books of Architecture]. The book set out his architectural principles as well as practical advice for builders. The most critical element, perhaps, was the set of meticulous woodcut illustrations drawn from his own works to illustrate the text. The work was subsequently translated into every European language and remains in print today both in paperback and hardcover. Palladio died in his adopted town of Vicenza in 1580.